Awesome Friday! » Blog Archive Review: Uncharted – The Lost Legacy - Awesome Friday! This chapter in the treasure-hunting Uncharted series was originally developed as DLC for Uncharted 4; with its shift of focus onto series favourite Chloe Frazer as playable protagonist, it’s easy to see how developer Naughty Dog envisioned their initial design. However, apparently, at some point it got “bigger”, leading to The Lost Legacy becoming a standalone story – but there’s a gross understatement by Naughty Dog here. Bigger doesn’t even cut it. What it has become is an 8-10 hour action adventure that simultaneously manages to be the best Uncharted, Tomb Raider, and even Pursuit Force. It’s a masterpiece of design and interactive entertainment. The story is split into two distinct chunks, and it’s here that we should have our first spoiler warning. To properly illustrate exactly why The Lost Legacy is such a triumph, the ebb and flow of these two disparate playstyles must be explored, but as they’re best experienced in blissful ignorance, please just go away and come back when you’ve finished it. My personal rule of not watching game trailers was justified here; each twist and surprise was fresh and wonderful, and I implore you to do the same. Post introduction, which is in itself a masterclass in storytelling and narrative pacing, the first section of the game is the open map. A first for Uncharted fans, this takes a wider approach that’s more similar to Metal Gear Solid: Ground Zeroes than the series’ usual linearity. If you’re as bored with open-world games as I am, this could feel like an early disappointment, but luckily you can relax; instead of un unfocussed space full of meaningless collectables and dreary traversing, it’s instead a beautifully contained area with focused aims and vistas to frequently gawp at. Once the requisite pieces of the puzzle has been unlocked, the second half starts, and here it falls into a more familiar format of linear exploration and combat. “Linear” has unfortunately become a dirty word in game design over the last few years, but I’ll fight that at every opportunity. For someone as story-focussed as I am, there’s no greater gaming pleasure than being taken by the hand through an extraordinary story, and Lost Legacy ranks as one of the best. There`s definitely some notable borrowing going on here from previous series entries, but it became compilation of many of my favourite parts from the whole series. The last level, in particular, is so expert in its delivery that I’d be surprised if you ever experience a better linear finale. Much of The Lost Legacy’s charm comes from the new paired protagonists. Chloe was always going to be an easy sell, voiced once again by the wonderful Claudia Black in a series-best performance, but it’s Nadine Ross that initially seems a bad choice. As per Uncharted 4, she’s all efficiency and stoic bluntness that feels slightly empty next to Chloe. However, once the game settles in, it becomes clear that the growing interactions between the two are softening and warming as the characters experience the adventure together. This chemistry is beautifully directed to give both characters space to emerge and travel along their arc, with Naughty Dog’s usual high mo-cap standard shaming most other game developers (and even many filmmakers). It’s a beautiful, blissful combination that pays off in the most satisfying way. Combat is still pure Uncharted – bombastic, if a little scrappy – but the balance is far more successful here than in Uncharted 3. Also, the stricter focus on runtime means that there’s none of the navel-gazing flashbacks that I found so distracting in Uncharted 4. 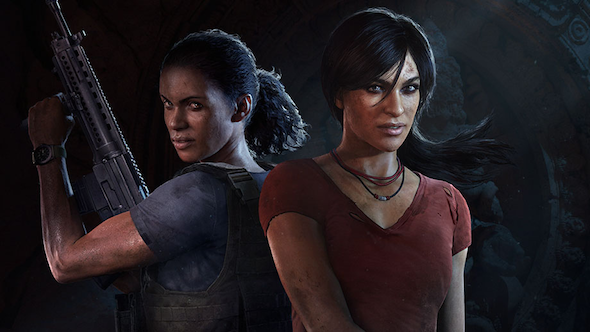 In fact, that’s not all that game loses – the replacement of protagonist Nathan Drake was a risky move, but one that hugely benefits The Lost Legacy to the point where I actively want Chloe and Nadine front and centre for the next Uncharted. By the time you reach the pitch-perfect ending, having fought through an utterly breathtaking final sequence, The Lost Legacy shines in self-contained brilliance. Naughty Dog may not make any more Uncharted titles, but it’s a certainty that Sony will want to keep its prime PlayStation flagship alive, so all we can do is hope that they take all of The Lost Legacy’s lessons: brisk, self-contained adventures, with stunning setpieces, and a heart so big it bursts out of the screen.